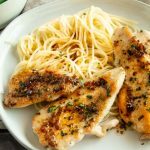 Golden brown seared Stove Top Chicken seasoned with fresh tarragon and a vermouth shallot butter sauce spooned over the top is a simple, one pan dinner that you can have on the table in less than 20 minutes! Busy times call for quick dinners. This Tarragon Butter Stove Top Chicken recipe is made in about 20 minutes with a complex sauce with simple ingredients. French tarragon, vermouth, butter and shallots quickly made in a skillet with the juices from sautéing thin cuts of skinless chicken breasts. I love to entertain (I know, no surprise) but with the hustle and bustle of the massive to do lists sometimes it can be overwhelming to plan a dinner party and get all of the other things in my life done. 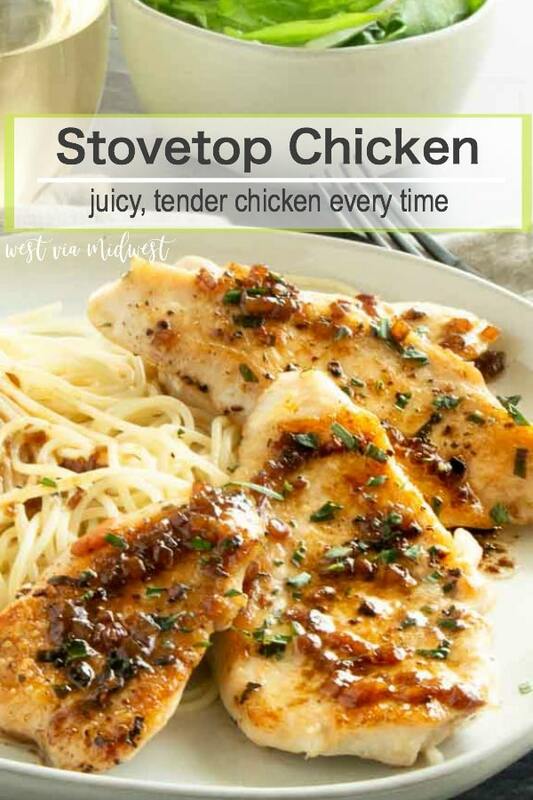 When its super crazy I like simple stovetop chicken recipes because not only are they economical (I just bought chicken breasts for $1.69/pound???) but I can put them together in no time! Who doesn’t love comfort food recipes that come together quickly and don’t use a lot of pots and pans like this healthier chicken piccata or even this one pot smoky jambalaya? But I’ll admit it sometimes I want things even faster than those! 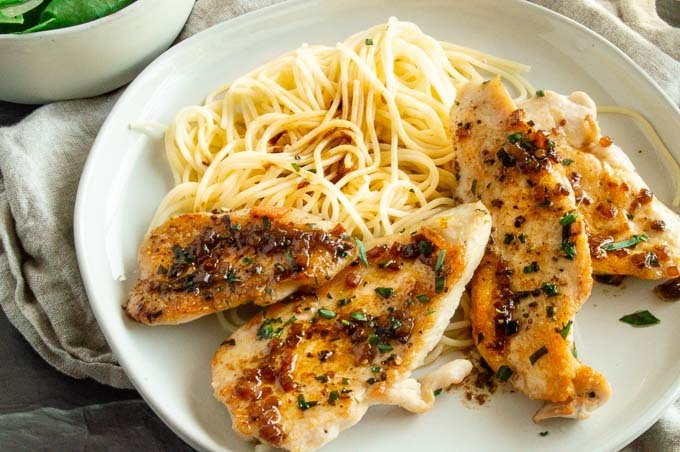 This pan cooked chicken recipe can be on the table (with a simple side dish of pasta and a salad too) in less than 30 minutes if you follow some simple steps in your cooking! CLICK HERE to pin this recipe for when you need a quick, yet impressive dinner in no time! Start by buying skinless and boneless chicken. You’ll still need to trim away any excess fat on them, but it saves a lot of time deboning and removing the skin. 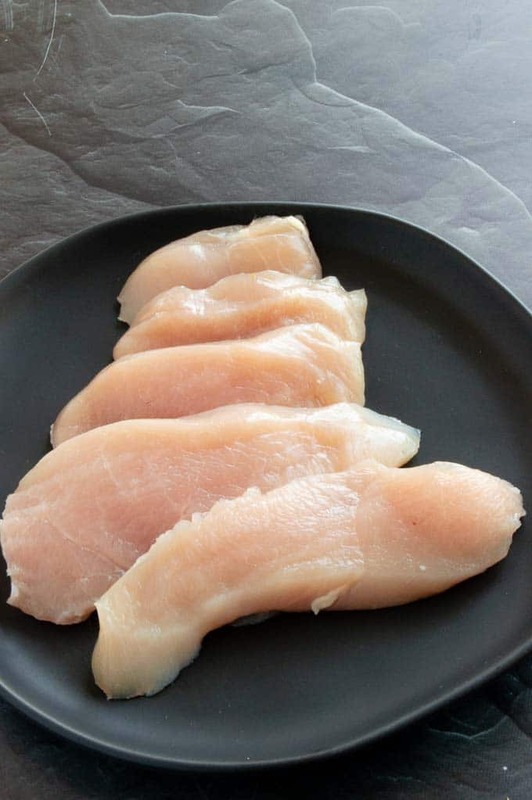 I recommend you cut the chicken (Im using breasts in this example) to smaller, thinner pieces which allow for you to cook them super quickly on the stovetop. Cut them on the diagonal to about 3/4″ in thickness. The chicken is hearty enough to get a good meaty bite, but it’s also thick enough so that it stays juicy and moist during the cooking process. If you cut it too thin, its very easy to overcook and dry out the chicken. Pay special care to get all the chicken the same thickness so you will have an easy time of cooking each piece evenly. Once you’ve cut the chicken to thinner pieces, dry it off with a paper towel then season it generously. When you’re pan searing the chicken those seasonings will stick to the chicken and bring out the natural flavor of the chicken even more. Even if some of the salt and pepper and bits of the chicken edges stick to the pan, you’ll end up scraping all those caramelized bits when you are making the sauce. What pan to use for sauting chicken? I like cast iron pans or thick bottom pans that conduct heat evenly. I find the chicken cooks more evenly and those types of pans. Added bonus, cast iron is easy to clean up! How to get juicy chicken every time? Cook the chicken on medium high heat to avoid drying it out and cooking it too quickly. 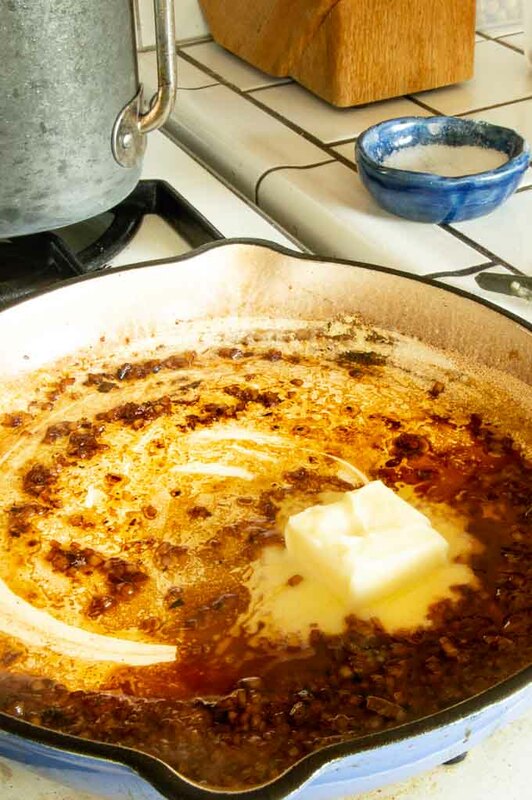 Turn on the burner and place your skillet, pan, cast iron pan on and let it get hot, then add your oil and let it get hot. This will help with even cooking and help the oil to not burn. PRO TIP: You know the oil is ready when you add a bit of tarragon or shallot and it sizzles immediately. How to get a good sear on your chicken? Once you place the chicken in the pan leave it alone. If you let it be, you will get a nice golden brown sear on it that not only tastes wonderful but looks great for presentation. How long to cook the stove top chicken breast? You’ll only cook the chicken at this thickness 1-3 minutes per side flipping it only once. 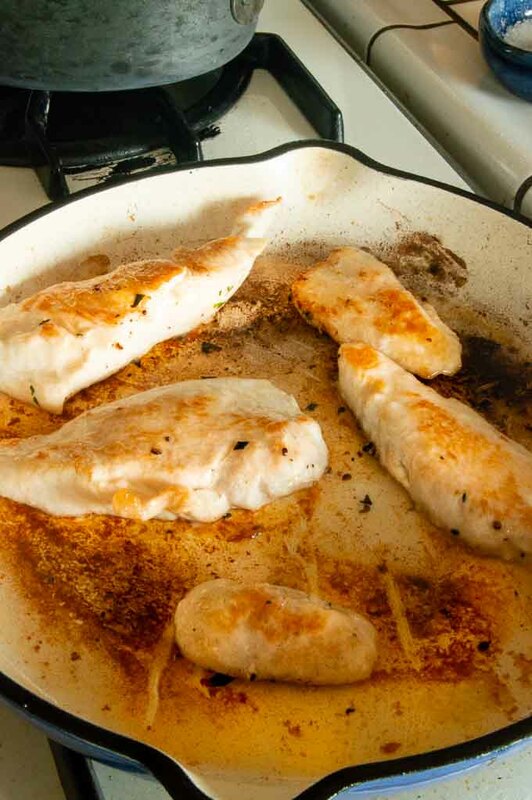 You’ll know when to flip it when you can see the whites of the cooked chicken on the edges. Since you’ve paid special care to make sure each piece is evenly cut to the same size you can cut into only one of them to test to make sure that the chicken is opaque (white, no longer pink) and that the juices run clear. 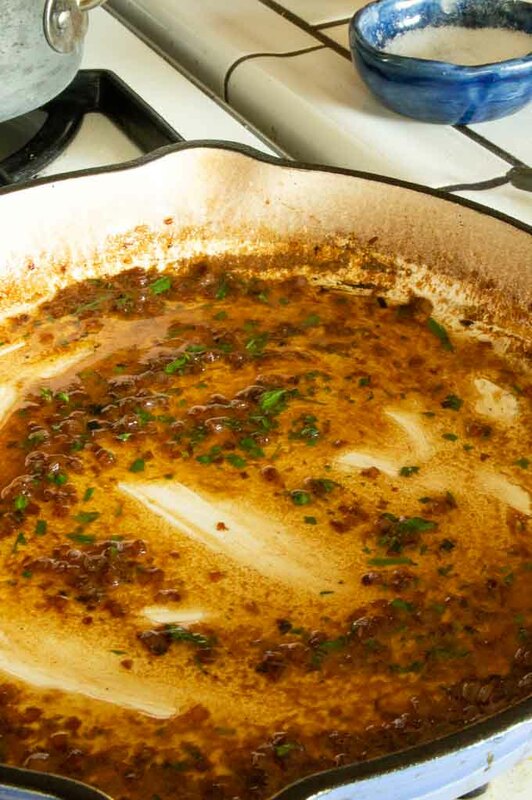 How to make the best pan sauce? 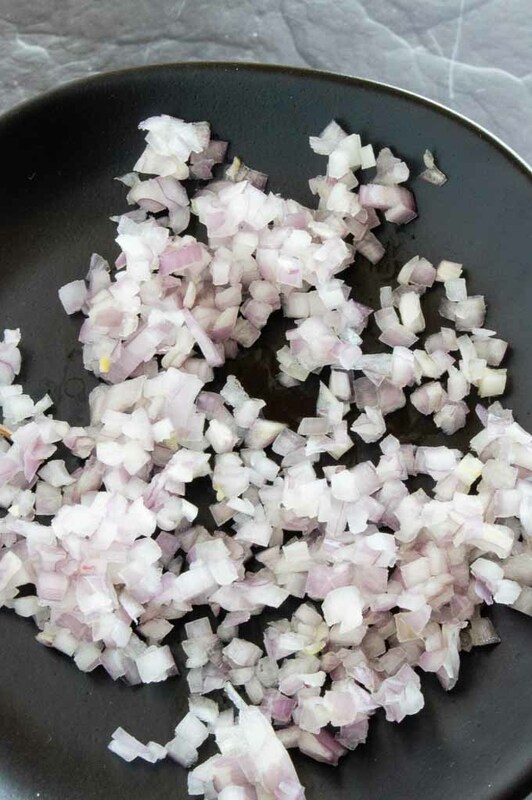 Start by cutting your shallots into all the same size. You want a tiny mince so that each bite is subtle! Then deglaze the pan by adding the vermouth and stirring constantly. 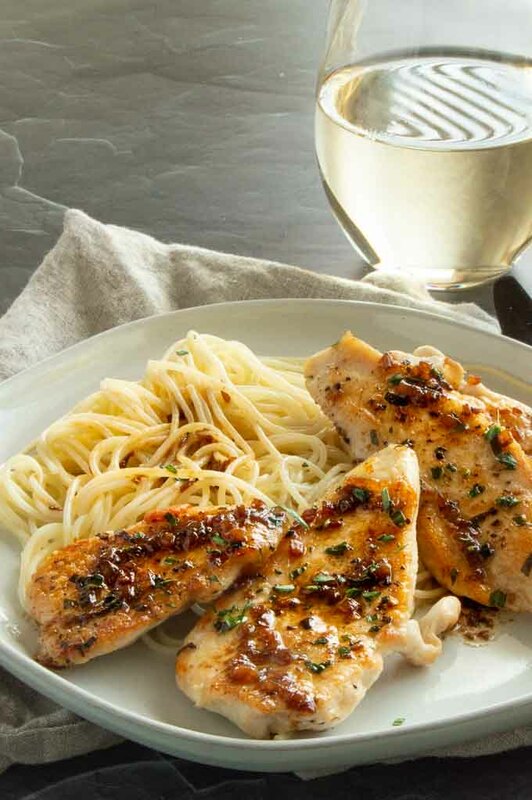 You’ll be able to get all of the crispy browned bits leftover from the sautéed chicken breasts and incorporate all that rich flavor into your butter sauce. 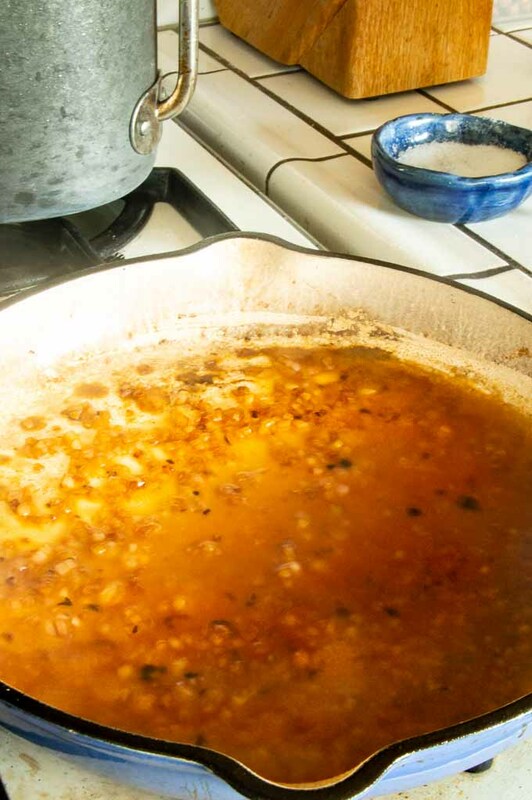 Allow the sauce to reduce a lot to really concentrate the flavor in each spoonful. It reduces quite quickly. Once its reduced you’ll add the butter and whisk it in to give the sauce a nice velvety texture. See how much it reduced in just a couple of minutes? Lastly you’ll season the sauce with the fresh tarragon and mix well. Then be sure and taste the sauce. You can season with salt and pepper to your taste. Place the chicken back into the pan to warm for just a minute, then serve immediately. Spoon a couple of teaspoons over each plate of chicken. You can serve this with a simple pasta. I usually use the same sauce over the pasta. Its quick, easy and so flavorful. You can serve it right out of the pan too if you want! ♦ Can you use other chicken pieces? Yes! This method works with chicken thighs just as easily. The chicken times are about the same since you are cutting them to thinner pieces. 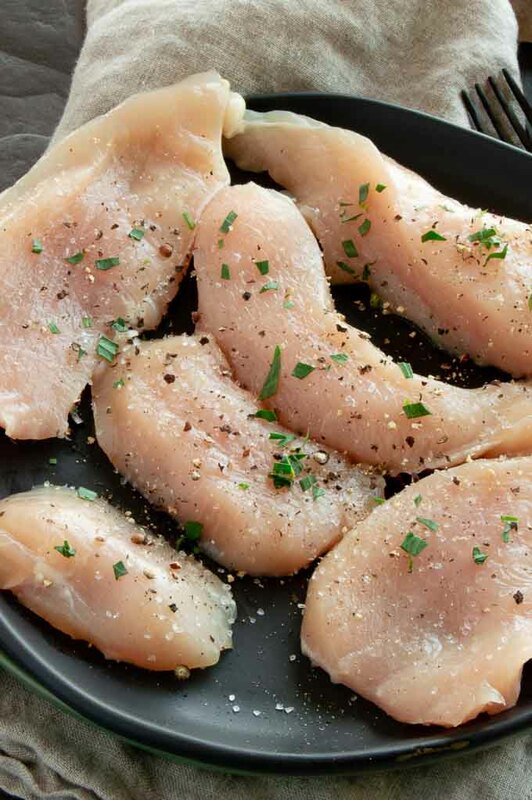 ♦ Can you use whole chicken breasts? You can, but the cooking time will increase. I suggest you pound the chicken to equal thickness for the whole piece so it cooks evenly. ♦ Can you use chicken with the skin left on? Yes, but you’ll have to watch it carefully and not let it burn. It usually sticks to the bottom of the pan so if Im making skin on chicken I suggest roasting it in the oven so it stays intact. ♦ I don’t have any vermouth? What can I substitute? White wine works just as well. ♦ I dont want any alcohol in my sauce is there a substitute for that? You can use chicken broth in place of it. You might want to add a small bit of vinegar to add a little acidity, or a squeeze of lemon juice can be added to the broth to help balance the flavor. Make the sauce, reduce it then taste it… if it seems a little flat, try the vinegar or the lemon juice at the very end when you are adjusting the salt and pepper. ♦ Can I use another meat in this recipe? Yes! Pork tenderloin or thin cut pork chops would work beautifully in this recipe? The cooking time will vary depending on the size and thickness of the meat. ♦ I dont have any fresh tarragon, can I use something else? Yes, you can use any thing you like. Fresh herbs like thyme, basil or oregano are perfect substitutes. You can also use dried herbs, but you’ll have to taste the sauce to see how much more or less to use. Start with a small amount and slowly add more until its just a subtle hint in each bite. Pat chicken dry with a paper towel. Then season generously with salt, pepper and 1 teaspoon of fresh minced tarragon. Heat a large skillet on the stovetop to medium high. Add olive oil and swirl the oil to coat entire bottom of the pan. Add the chicken and let cook for 1- 3 minutes until you see the whites of cooked chicken coming up the side of chicken. Do not touch or move the chicken until you see the white on the sides. Flip chicken and cook for 1-3 minutes until cooked through and each side is seared to a golden brown. Remove to side plate. Cook chicken in batches if your pan is smaller. Once all the chicken is cooked, if pan is dry add a couple of drops more of olive oil. Then add shallots and sauce until softened about 1 minute. Add vermouth (see note 1) and scrape up all the brown bits from the bottom and cook for about 2-3 more minutes until vermouth is reduced by about half. Reduce the heat to low. Add the cold butter pieces and whisk until incorporated. Add the rest of the tarragon, and then season with salt and pepper as needed. You can use white wine or chicken broth in place of vermouth. The flavor will be slightly different, but it is still very delicious! If you want to have a lot of sauce, double the recipe. It works great over pasta! Love these kinds of recipes, so easy and yet the presentation is perfect for entertaining. I can never have too many chicken recipes! This is the most informative post I’ve seen on cooking chicken on the stove top. Thank you for all of the tips and information, not to mention this AMAZING Recipe!!! I absolutely love meals like this one!! That pan sauce sounds absolutely perfect!!! This would be such a hit at my house! I love making chicken and the sauce sounds so flavorful! What a delicious and simple dish. The deglazing step is my favorite so that I get all those flavors in the finished dish. Trying this with pork since that’s what I have right now. This chicken looks so delicious! I love meals that come together in under 30 minutes, it makes dinnertime so easy! 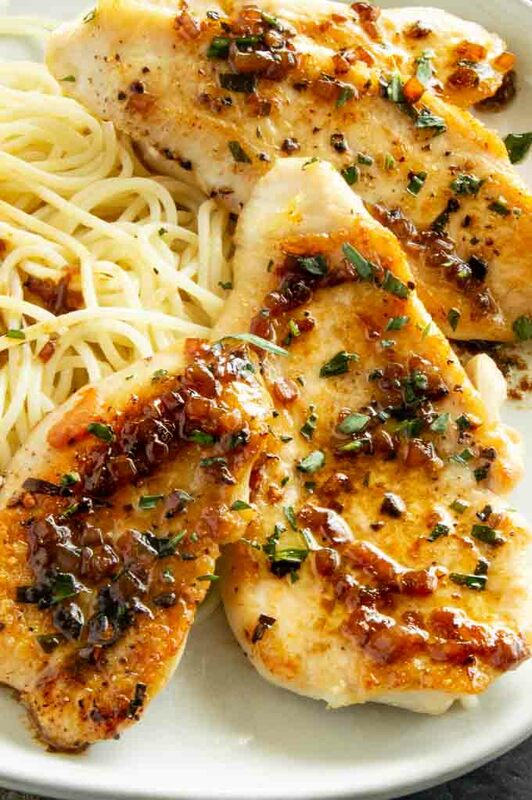 Pan sauces are the best for getting dinner on the table so quickly. This one looks so full of yummy flavors. My family will love it. Tarragon is my favorite herb andI think is incredibly under used. I will be making this chicken dish for sure! Not only because of the tarragon but because although it looks so fancy and elegant, it is so easy to make! A win win for sure!! I love this. It’s hard to believe something so quick and simple, creates such a complex and delicious taste.